It's important that the pecans be well-toasted so they impart maximum flavor and crunch to the candy. But the most important thing is to use a candy thermometer to make sure the sugar is cooked to the right temperature. Otherwise, you might end up with a gooey mess on your hands. In a medium saucepan combine the white sugar, brown sugar, and evaporated milk over medium heat. Stir until the sugar dissolves, then insert a candy thermometer. Cook the candy, stirring occasionally until the candy reaches 240 F on the thermometer. Once the proper temperature is reached, remove the pan from the heat and drop the cubes of butter on top, but do not stir. Allow the pan to sit for 1 minute. After 1 minute, add the vanilla extract and the pecans, and begin to stir smoothly and constantly with a wooden spoon. Soon the candy will begin to get thicker and lighter in color. Continue to stir until the candy starts to hold its shape. It should still be easy to stir, however. 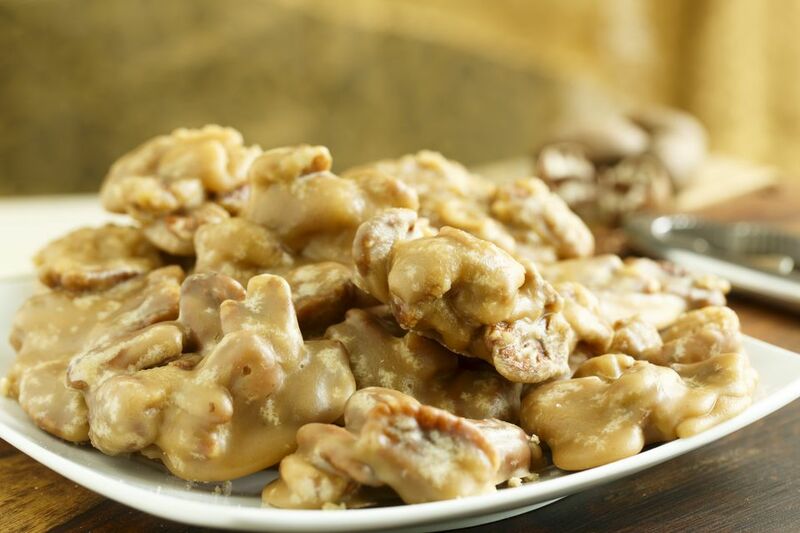 It is important not to stir too much, as pralines quickly go from fluid to rock-solid. Once it is a lighter, opaque brown, and holds its shape, quickly begin to drop small spoonfuls of the candy onto the prepared baking sheet. Work quickly to form the candies, as the pralines will start to set in the saucepan. If the candy stiffens before you’re done scooping, add a spoonful of very hot water and stir until it loosens, then continue scooping until you have formed all the pralines. Allow the candy to fully set at room temperature, for about 30 minutes. Store New Orleans pralines in an airtight container at room temperature.